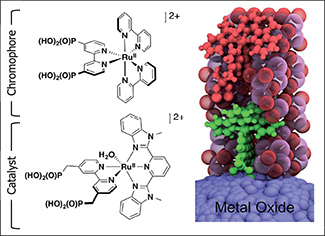 (Left) Chemical structures of the ruthenium chromophore (top) and catalyst (bottom) used in the mummified molecular assembly. (Right) Cartoon illustration showing a surface-bound chromophore (green) and catalyst (red) buried by the inert overlayers (transparent spheres). Published by The Royal Society of Chemistry. When it comes to renewable energy, capturing energy from the sun is promising, but remains a formidable undertaking. One approach toward harvesting solar energy is the use of solar cells, where improving their efficiency is an active area of research. However, even with the development of efficient solar cells, an important question remains: “What happens when the sun goes down at night?” While there are many ideas about how we can store the energy, researchers at the Center for Solar Fuels are taking lessons from plants to solve this problem. This strategy, termed the “artificial leaf,” uses the solar energy collected during the day to drive multi-step chemical reactions, such as splitting water to produce hydrogen fuel or converting carbon dioxide to carbon-based fuels. Put simply, this method takes energy from the sun and stores it in an incredibly dense energy source: the chemical bond. One such artificial leaf is the dye-sensitized photoelectrochemical cell (DSPEC), which consists of two separate electrodes. At one electrode, water is split to form oxygen and protons (that is, hydrogen ions) and at the other electrode, the protons can form hydrogen gas or be used with carbon dioxide to produce carbon-based fuels. The true workhorses at the electrodes are collections of adsorbed molecules called molecular assemblies that use sunlight to drive the chemical reactions to produce solar fuels. However, these molecular assemblies are susceptible to degradation by the pernicious solvent environment. Taking a cue from the ancient Egyptians, researchers at the Center for Solar Fuels are burying the adsorbed molecules and forming “mummified” molecular assemblies. Central to the DSPEC is the development of a molecular assembly that couples light absorption with catalysis to generate solar fuels. In plants, evolution through billions of years has resulted in photosynthetic machinery featuring remarkable chemical architectures. A key element of these designs is the incorporation of many light-absorbing pigments, spanning the solar spectrum, arranged to provide directional energy and electron flow to reaction centers where chemical fuels are produced. From the standpoint of a chemist, producing analogous assemblies on a large scale is a daunting task. 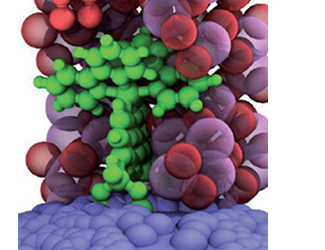 In comes artificial photosynthesis where the goal is simple: apply object lessons learned from nature to create simpler molecular assemblies and effectively bypass billions of years of evolution. The mummy assemblies are an example of artificial photosynthesis in action. In the mummy strategy, a single layer of chromophores is attached to the surface of one electrode and are then buried with an inert layer of molecules by a technique called atomic layer deposition (ALD). Next, a layer of catalyst molecules are adsorbed onto the ALD layer, and the molecules are then buried with a final layer to essentially wrap up (that is, mummify) the molecular assembly. The benefits of the mummy strategy are twofold. First, the inert ALD layers provide improved stability by shielding the assemblies from the solvent. Second, the synthetic steps toward the development of chemically linked chromophores and catalysts are bypassed; all that is required are chromophores and catalysts possessing chemical groups that will attach to the electrode and ALD layers. The researchers compared their results to molecular assemblies prepared by different chemical methods and found that the overall performance compares favorably, implying that the mummified assemblies are a viable option toward the development of future molecular assemblies. While it is uncertain as to what the next generation of molecular assemblies for solar fuels production will look like, the work here represents a first step toward facile development of multicomponent molecular assemblies with the added benefit of improved photostability in an aqueous environment. While the results from these mummified assemblies are favorable, future studies will incorporate catalysts with higher activity coupled with a second electrode for the production of carbon-based fuels. These configurations will be used with the ultimate goal of developing a fully functional DSPEC that operates solely on solar energy. Scientists wrapped up two types of molecules to create an assembly that can absorb light and produce hydrogen fuel. Permission granted by The Royal Society of Chemistry (see citation). Zachary A. Morseth is a Ph.D. candidate at the University of North Carolina at Chapel Hill and is a member of the Center for Solar Fuels. He is advised by John M. Papanikolas at the center. There, Zachary employs ultrafast spectroscopic methods and computational tools to study fundamental energy and electron transfer dynamics in multifunctional molecular assemblies for solar energy conversion. Zachary holds a B.S. in chemistry and a B.A. in mathematics from Minnesota State University – Moorhead. Solar panels don't work at night, but storing solar energy as fuel that we can use could be the answer. If we look closely, there are remarkable fuel-producing models all around us. Plants use clusters of molecules to turn sunshine into sugars, which are later used as fuel. In designing similar clusters, scientists struggle with gluing molecules together with covalent bonds and keeping them protected. Recently, scientists have simultaneously avoided this gluing step and protected the molecules with a "mummy strategy." They wrap the light-absorbing molecules in an inert layer. They then add catalysts, which use the energy from the absorbers to create chemical fuels. They then wrap it all up in a protective layer to produce a stable assembly that pumps out fuel for 6 hours when exposed to light. The team is now designing more active catalysts and easing electron flow through the assembly. Scientists at the Center for Solar Fuels, which is led by the University of North Carolina at Chapel Hill, did the research. Disclaimer: The opinions in this newsletter are those of the individual authors and do not represent the views or position of the Department of Energy. Can You Program a Protein?